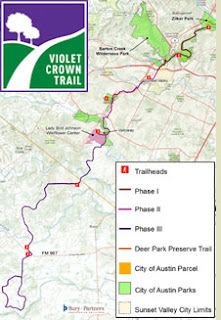 The Hill Country Conservancy recently published updates regarding the Violet Crown Trail. This proposed 30 mile trail system will travel from Zilker Park and come to a loop on the property just east of the Inn Above Onion Creek. Once completed, the southern tip of the trail might actually be visible from our overlook. While it will take many years to complete we are very excited to learn about this exciting news. It will be a great new activity for those coming to visit our hill country bed and breakfast. Austin 360 has some great information regarding the development of this ambitious trail system here.